ESPN Adjusts on the Fly for MNF’s Move From Mexico City to L.A. When the NFL announced yesterday that it will move Monday Night Football’s Kansas City Chiefs–Los Angeles Rams game on Nov. 19 from Mexico City’s Estadio Azteca to the Los Angeles Memorial Coliseum because of poor field conditions, ESPN’s operations team instantly sprang into action. 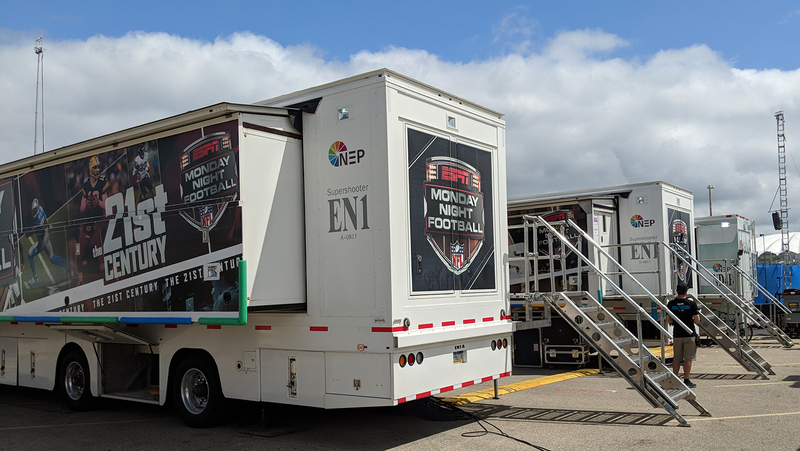 No stranger to handling last-minute logistics — the majority of the 25+ college football games ESPN produces each week are selected six days out — VP, Remote Operations, Chris Calcinari’s first move was to locate NEP’s fleet of EN1 mobile units, which serve as the weekly home for MNF. NEP’s EN1 trucks, home to ESPN’s Monday Night Football productions, had to be rerouted after the NFL relocated Chiefs-Rams from Mexico City to L.A.
Luckily for ESPN, EN1 was in Arizona — en route from last week’s game in Santa Clara, CA, to Mexico City — and wasn’t scheduled to cross the border until Wednesday morning. In addition to rerouting facilities and equipment to Los Angeles, Calcinari and company spent the next 24 hours rebooking flights and hotels for the 150-plus crew members set to work Monday’s game. Of note, ESPN had planned to send a portion of the crew out to Mexico City on Thursday, a full day earlier than usual (the MNF team typically begins arriving on Friday) because the game was taking place at a less familiar stadium. Monday Night Football producer Jay Rothman was primed to produce his third Mexico City NFL game (he was in the truck for Texans-Raiders on MNF in 2016 and for Cardinals-49ers on ESPN’s Sunday Night Football in 2005), but the shift in location creates a new landmark moment for the production team: Monday Night Football’s first appearance in Los Angeles since 1985. “We’re disappointed that we’re not going to be in Mexico City. We were really excited about the game when the schedule came out,” he said on a conference call Wednesday. “It’s a stadium that has great history; sold-out, boisterous crowds; and unique sights and sounds — very different from what we’re used to. We enjoyed the heck out of our last experience there so we were excited, but we understand the circumstances and just had to adjust.